■ Beef liver and clams, which are the best sources of vitamin B12. 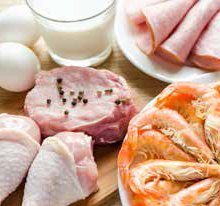 ■ Fish, meat, poultry, eggs, milk and other dairy products, which also contain vitamin B12. ■ Some breakfast cereals, nutritional yeasts and other food products that are fortified with vitamin B12. To find out if vitamin B12 has been added to a food product, check the product label. Vitamin B12 is found in almost all multivitamins. Dietary supplements that contain only vitamin B12, or vitamin B12 with nutrients such as folic acid and other B vitamins, are also available. Some conditions may impair the absorption of vitamin B12 when it’s taken orally, so injections may be necessary. Check the Supplement Facts label to determine the amount of vitamin B12 provided. Talk with your doctor about whether you need a vitamin B12 supplement and if so, the correct amount for you.